“Slow and steady wins the race”, that's what I told you guys last time. Remember? It was good advice and it still is. You can take that for granted. However: “The exception proves the rule”. Ergo, today's story. the house (compared to where I am now, the term forest doesn't seem fit to describe the collection of 20 trees I am talking about, but anyways, in my imagination it was just that). My friends and I pretended to be these professional riders who feared not a single slope or obstacle. You know how kids get. What were you like? When we grow old, imagination tends to turn into realism and dreams may fade away (or at least that's what we grown ups tell ourselves). That's exactly what happened to my Riders dream until..., I arrived in Canada and met Adam, the guy I am bunking up with at this ranch (The Ranch story is for next time). Who's Adam? 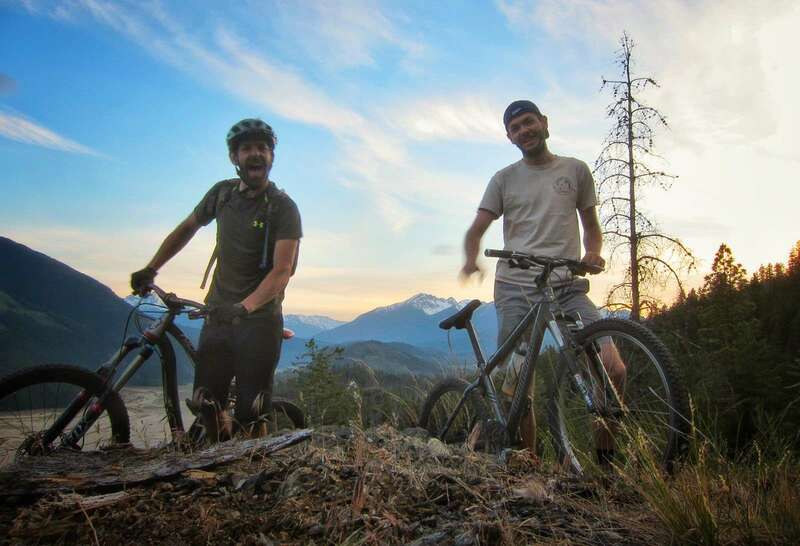 Adam is a 40 year old Canuck and he earns a living as a mountain bike guide. I kid you not. But wait, it gets better. Before he is able to guide people around, he needs to get to know the area and its trails. For that, he needs a Guinea Pig. Guess who volunteered. That's right: yours truly. The plan – A truck drives us up to 5 Mile Ridge, we get out of the truck, jump on our bikes and it's all downhill from there back home, to The Ranch. Preparation – Two bikes, helmets, comfortable shoes (boots for me, didn't bring anything else than boots and slippers), two apples, a bag of raisins, a spare tube, patches and most importantly: a drink that keeps us hydrated. A drink, not just water. You see, my personal guide made this substitute for Gatorade: green tea, salt and orange juice. Put it in the fridge for a couple of hours and you've got yourself the perfect drink to go out on your bike. The ride – At 8:15 pm local time, my dream comes true: I am about to commence my downhill adventure in British Columbia! For the connoisseurs among you readers, it was no Black Diamond trail, I realize that, but for this rookie, it was pretty intense. Here we go. I take the lead on the first slope of the ride. Because I'm slipping and sliding all over the place, I let go of the brakes. Boom. Continuing the descent with my friend Adam and a dust cloud trailing me. We go left, right, left and right again. Cruising down, rocks and small holes all over the place, the South Chilcotin Mountains our canvas. After a long stretch there's this zigzag. Scared of washing out (being a rookie and all, you know), I use the bank on my left hand side to slow down. Maybe not the best decision: at the end of this bank a small tree is blocking my path. I let go of the bike and jump over the fallen tree landing on my two feet. Good job Sammy. Downside: flat tire. No stress, we brought a spare tube and patches. So we look for a small creek and use water to see where the tube is punctured and we patch it up. Easy peasy. We continue down the road; same story: left, right, left, right,..., picking up speed,... BAM! I hit a rock and this time the tube of my rear wheel goes Snake Bite. This is not my day. But no reason for despair, because after this second incident, luck turned in our favor. Wildlife – “Two flat tires won't bring me down”, I say to myself. So I take the lead again. Near the end of the trail, just after a slight little turn, right in front of me, there's this wolf pack getting ready to attack a deer. Because of our approach and me shouting very excitedly “Wolf, Wolf!”, the pack goes left and the deer goes right, running off into the bushes. Good job: we saved the deer's life. We stop to check out the tracks and suddenly we hear a stressed bear growling in the bushes. We brace ourselves, bear spray ready to use. The growling gets louder and we see it approaching through the bushes... What happens? To our surprise, a bullfrog appears. Didn't we look stupid? Yes, we did, but we also felt relieved. I told you luck would turn our way. Safe and sound, me and my bud return homewards. The next day, thus today, I am contemplating on this experience and try to to think what we can learn from this story (besides always to take spare tubes and patches with you). Well, for me personally, it's the following. If you have the feeling that your losing your imagination and that your dreams are fading away: go travel, go explore and look for new horizons. In this way, you might feel like a kid again. I know I did when I was cruising down that mountain.